A question spoken with a desire to hear the thoughts and feelings of the recipient can have a powerful effect on an individual. 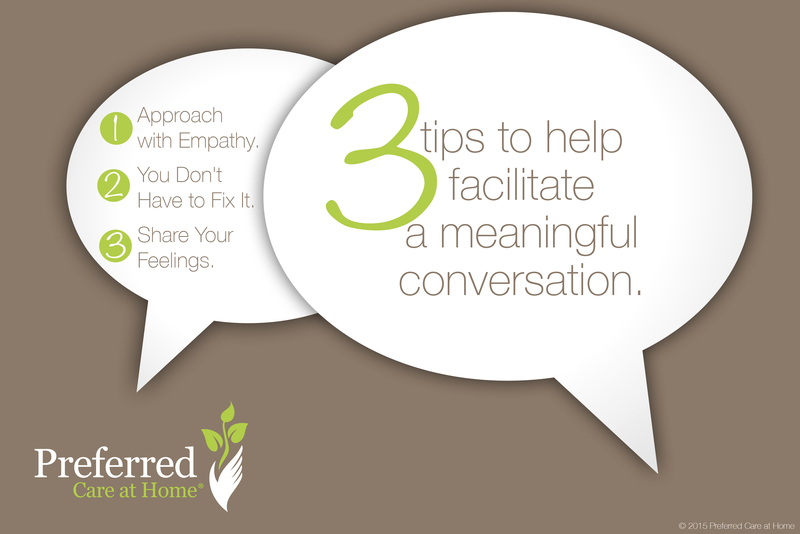 For seniors, a meaningful conversation where they feel heard can have tremendous impact. For many elderly, their world can feel outside of their control, their life is ever-changing, maybe their living situation has changed, loved ones have passed away, their health is declining, and their freedom has diminished. Instead of ignoring the changes mom has gone through, ask her how she is doing. 1. Approach with Empathy. When you engage your senior loved one, think about all the changes and transitions that have happened in his or her life. If your mom has just moved to a facility, don’t be afraid to ask if she misses her home. Letting your mom talk about the transition can help with the adjustment and even ease some of the grief. 2. You Don’t Have to Fix It. If your loved one is sharing about a difficult experience, you don’t have to have answers. In fact, trying to solve the problem or fix it can minimize the emotional experience for your elderly loved one. Instead, just listen. It may feel awkward at first, but often times all we really want is to feel like someone is listening to what we are saying. 3. Share Your Feelings. Don’t be afraid to share what you are feeling. For example, if you are feeling sad or guilty you couldn’t provide all the care you wanted with your elderly loved one, let them know. When one person opens up with what they are feeling, it creates a space for the other person to do the same. For more tips on caring for your senior loved one, visit our Family Learning Center. If you would like more information about the senior home care services we provide, contact a location near you.